Wescor 7321 Aerospray Gram Slide Stainer Cytocentrifuge Microbiology Sample Prep . New Life Scientific, Inc. This Wescor 7321 Aerospray Gram Slide Stainer/Cytocentrifuge is in good working condition with some wear and staining. The compact design results in a small bench top footprint, making it able to fit into any laboratory environment with ease. The Aerospray Gram staining process is fast, accurate, and consistent, staining slides for the microscope in just a few minutes. 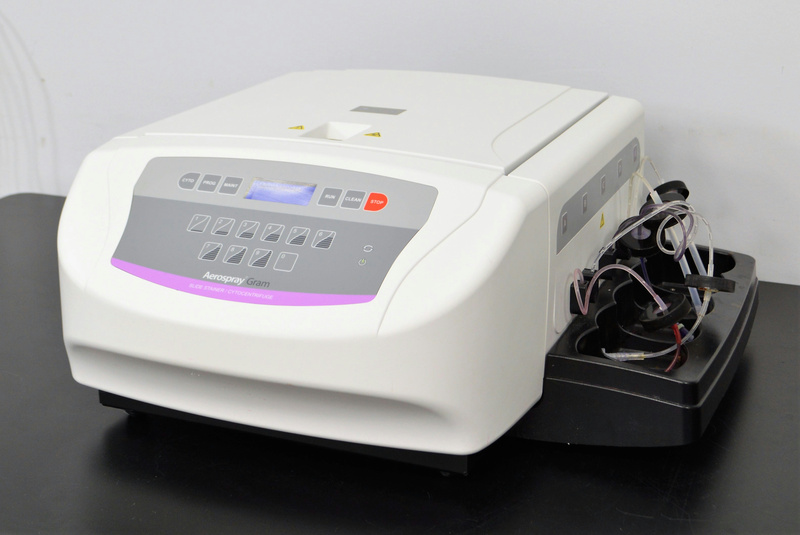 This instrument is a perfect choice for any laboratory in need of a fairly price, reliable slide stainer/cytocentrifuge. Our in-house technician visually inspected, initialized, and tested the Wescor 7321 Aerospray Gram, confirming the instrument to be in good working condition. Lines were cleared with alcohol and rinsed with distilled water, leaving water in the lines to prevent clogs from inactivity. Jets have been cleaned with an ultrasonic cleaner and flow has been checked, showing all ports to be at operational pressure.